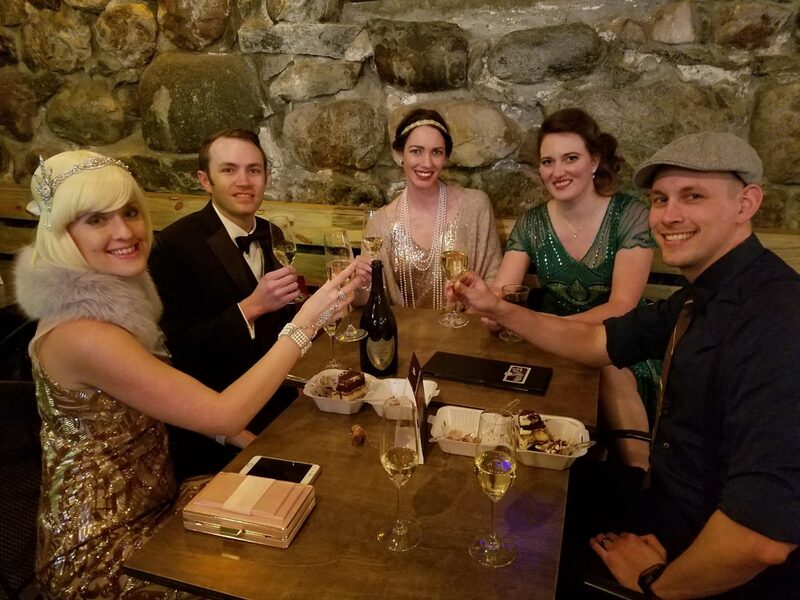 Submitted Photo A group dressed in dapper attire enjoy swigs of champagne at The Tap Room during the Roaring 20’s Pub Crawl in downtown Minot. Looking for a reason to attract more people downtown after the infrastructure project construction, Jon Lakoduk of The Tap Room thought of a St. Patrick’s Day pub crawl in 2017 that would unite downtown businesses and give people an incentive to come downtown. With a thirst for more, the Little Chicago Pub District was born between Lakoduk, Sherry McGlaughlin of The Spot and Sabreena Deadmond of Ebeneezer’s and includes varying bars in downtown Minot. It looked like the weather was going to be nice for St. Patrick’s Day in 2017, so Lakoduk decided to throw together a scavenger hunt with a bunch of questions about Minot’s downtown. The questions ranged from where to find certain shops to which musician was pictured in a poster at Budget Music & Video. 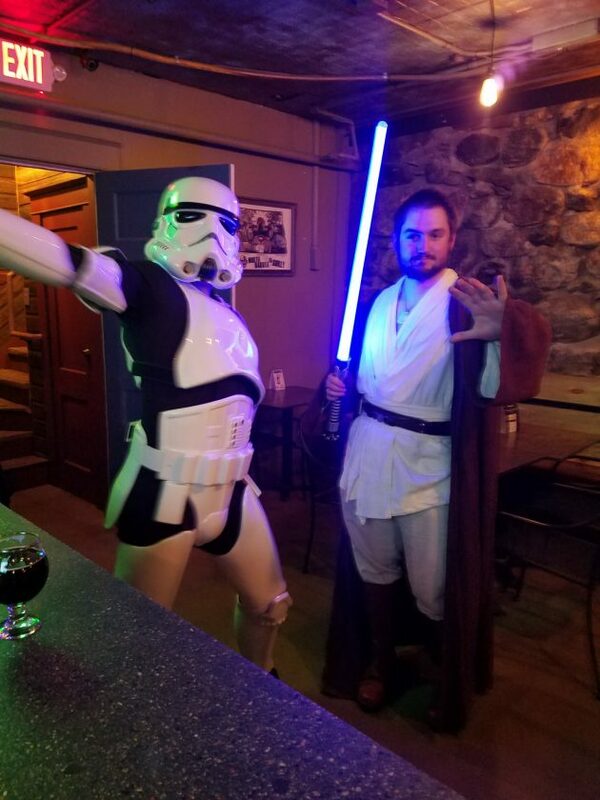 Submitted Photo Bar hoppers dressed as a storm trooper and a Jedi pose for a photo during one of Little Chicago Pub District’s pub crawls in downtown Minot. This is how Lakoduk connected with Deadmond and McGlaughlin after introducing himself and inviting them to be a part of the scavenger hunt. After that first pub crawl, the group got together and decided to make the crawls a regular thing for downtown. Being held in the heart of what was known as the Little Chicago area of Minot during prohibition, the group decided to play off the name and Minot’s history. With stories of Al Capone being in Minot and local businesses stashing booze from Canada to then be taken by railroad to Chicago, it was fitting for the pub crawl brand. 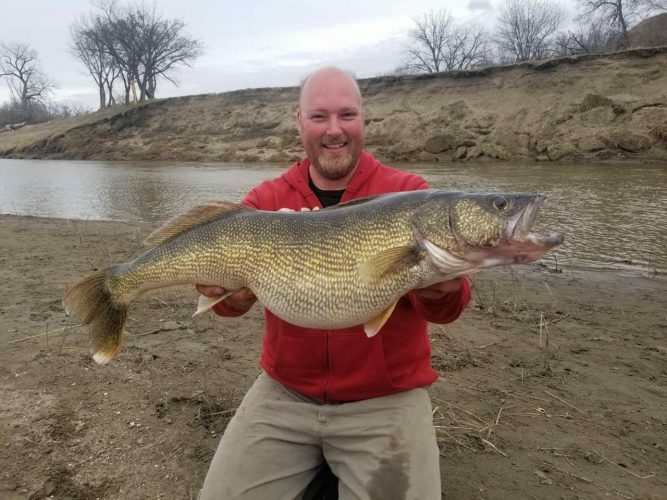 While some residents may shy away from this part of Minot’s history, the pub district enjoys playing into the history. It was something fun that the group embraced and are now hosting events all around Minot. Wizards, witches, elves and giants in Minot take quite the liking to Little Chicago’s Potions and Pubs pub crawl. People have the chance to show their house pride and throw back a delicious drink with their pals while talking about the latest spells to hit the streets. The crawl returns for another year April 27 downtown for those who want to break out their cloaks and dust off their wands. They also found a lot of success with the Pints and Puppies pub crawl that was hosted with the Souris Valley Animal Shelter. The second annual Pints and Puppies will come to downtown at the end of June in 2019. They push that people potentially interested in adopting should fill out an application with the shelter ahead of time just in case they fall in love with a furry friend at the event. They also love to support local nonprofits and work with them for pub crawls. Last year featured a pub crawl with Pride Minot. One thing McGlaughlin has noticed is that it not only brings traffic to the participating bars downtown, but it also draws attention to downtown as a whole. Now, the group is trying to make downtown Minot the place to be for nightlife. They also feel like they’ve helped restore the image of downtown and that it means to shop and spend time there. Despite the parking garage disdain, people are constantly asking the Little Chicago Pub District when the next one will be and are excited to get downtown. Deadmond feels that downtown as a whole is looking for ways to draw people to the different local scenes and gems. The businesses are banding together to help each other thrive. “We have a lot of really cool shops downtown that not everybody goes to because they go straight to the mall,” Deadmond explained. Now, the pub district is also getting calls from groups to organize pub crawls for them. Different squadrons, school reunions and organizations have been taking notice and are interested in what LCPD brings to downtown. It’s all about coming together and, as Lakoduk said, the high tide will float everybody. 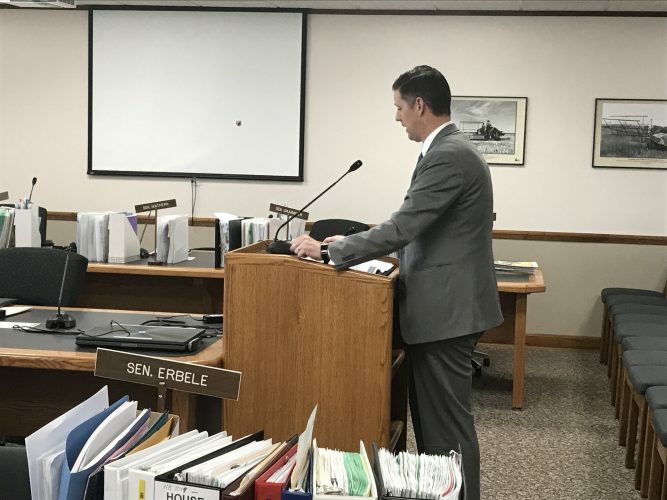 They also want to help point out to residents that there are cool, fun things to do in Minot to help keep some of the young people in town instead of looking to move to other cities or states. 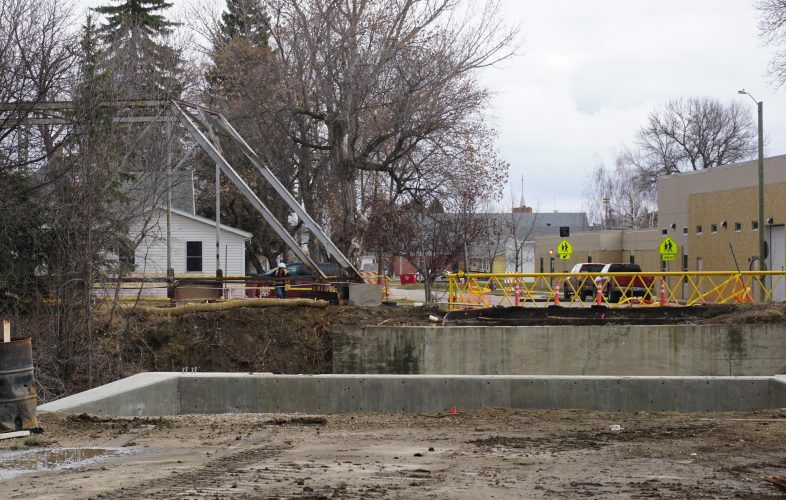 To bring light to the different aspects of Minot, Little Chicago Pub District has worked with the Dakota Territory Air Museum and helped them put on seven different events last summer and plans to do the same thing again this year. “To me, it’s one of those hidden gems that nobody really knows where it is, what it has but it’s super informative and super cool,” Deadmond said. As a group, they do collaborate to do things away from downtown, but downtown is where it all began. To stay up to date on all things Little Chicago, check out their facebook page @LCPubDistrict.